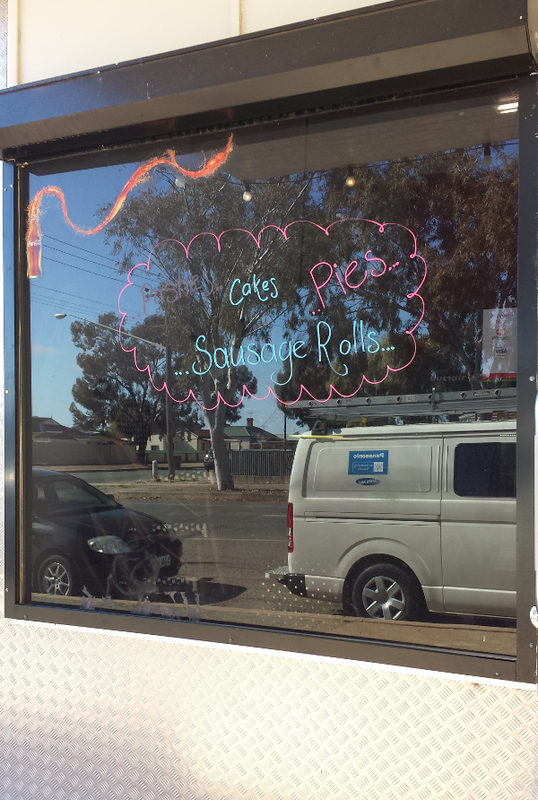 Although we’ve ticked off the ‘eating a meat pie in the outback’ off our list of things to do whilst we’re here in Broken Hill, we’re not sure last time counted since it was in a cafe instead of a bakery and we did get the fancy flavours which technically doesn’t count as a ‘meat’ pie. So this called for another meat pie for lunch, and we sneak out to the bakery around the corner to have a real meat pie. From what we’ve heard, there’s two main bakeries in Broken Hill- Mac’s and Baxter’s. We’re keen to try both but Baxter’s is much more convenient for us, with their bakery just round the corner from where we’re working and their cafe in the only major shopping complex. The bakery itself is a small building sandwiched between a couple of houses. Blink and you’ll miss it. It’s a tiny bakery with only one pie display cabinet and one cakes display cabinet, but business is good as we notice plenty of locals driving over just to purchase pies and pastries for takeaway for lunch. It’s more of a takeaway style business but we’re lucky enough to snag the only table outside the bakery to chow down our treats! They close quite early so when we arrive at 1pm, there’s only about 3 different varieties of pie to choose from. I almost ordered a normal meat pie but couldn’t resist the cheese and bacon one, with the delicious layer of melted cheese on top. I’d imagined the pie to have a bacon filling, but it makes much more sense the way they’ve done it, which was to have the normal meat filling with bacon bits dispersed within. The filling is quite tasty, although a little too salty for me (as was my friend’s meat pie!). The pastry was extremely light, flaky and crispy, although it was also quite oily! All in all, a pretty solid pie though I think we prefer the ones at The Caff! And although we’re here just to try the pies we couldn’t leave without trying at least one of their many tempting cakes and pastries. Choosing only one was the difficult task, as there was plenty of delicious looking options on display! I eventually settled on the mocha cheesecake and was glad I had a spoon in my bag as they didn’t have any plastic forks or spoons at the time! The cheesecake itself was a little blander than I’d expected- there’s only a hint of coffee flavour, and it’s not too sweet either. The sweetness is just right when you combine it with the rich chocolate layer (my favourite part of this cake!) and the cheesecake layer was nice and light, though I did wish there was a bit more coffee flavour! Ooo!!! The piece quite a thing. I would love to have try. For the cheesecake, would also have loved more power of the coffee. After all, I'm a big fan of coffee. Mmm cheese and bacon pie sounds awesome. Loving the thick layer of melted cheese on top! Hi Von, the meat pie and cheese cake look awesome. I don't mind to have extra. Cheese and bacon are great pairing.